The Album Frame quilt block is another great choice for a beginner quilter to learn the piecing skills. This block is composed of simple shapes -- squares and rectangles -- and also the most commonly used quilt patch -- the half square triangle unit. 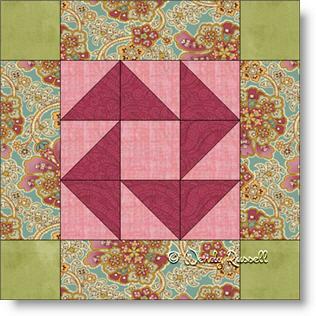 This quilt block is made of up two distinct block styles -- the nine patch for the central motif and then this small quilt block is used as the centre in the final block which then is classed as an uneven nine patch. The uneven nine patch is constructed in the same manner as the nine patch, but because all of the nine separate patches are not the same size, hence the name "uneven" nine patch. The sample quilts illustrated give you some ideas on how to create a quilt using this one block. The straight set quilt uses sashing to separate the blocks while the on point setting uses additional plain squares to set off the arrangement.